It could have had a much different outcome. A family of six spent two days in the Nevada wilderness in sub-zero temperatures after their Jeep rolled off the side of a dirt road and into a crevice. James Glanton and his girlfriend Christina McIntee huddled with their two children, and her nephew and niece, keeping everyone together and keeping everyone warm. 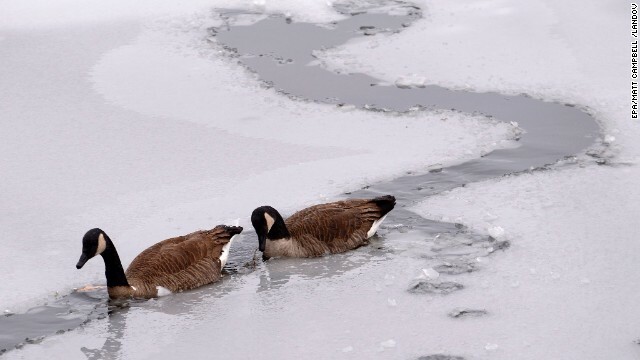 After they were found Tuesday, all six were in stable condition with "no frostbite, just some exposure issues," said Patty Bianchi, the CEO of Pershing General Hospital. Dr. Doug Vacek told reporters they all were doing "very well." So how did this family manage to survive two days when others may not have been so lucky? Here are five things the family did right. Frigid weather gripping much of the United States led to a frenzied search in northwest Nevada, where rescue teams are searching a mountainous area for two adults and four children who went to play in the snow and never returned. James Glanton, 34, and Christina MacIntee, 25, are missing, along with Glanton's two children and MacIntee's niece and nephew. The children are three to 10 years old, the Pershing County Sheriff's Office said. The group set out Sunday for Seven Troughs mountain range and haven't been seen since. With 25 million people in its path, Super Typhoon Haiyan - one of the strongest storms recorded on the planet - smashed into the Philippines on Friday morning. As the storm plowed across the cluster of islands in the heart of the country, casualties were reported, more than 100,000 people took shelter in evacuation centers and hundreds of flights were canceled. The storm brought tremendously powerful winds roaring ashore as it made landfall in the province of Eastern Visayas, disrupting communications with a major city in its path. Preparations are under way on India's east coast ahead of Saturday's expected landfall of a massive cyclone now gathering strength in the Bay of Bengal. Authorities are shuttling multitudes of people out of its path, following a practice developed after a similar cyclone killed thousands over a decade ago. They are giving residents no choice in the matter. A soggy weekend is in store for parts of the U.S. Gulf Coast as Tropical Storm Karen churns in the central Gulf of Mexico. The National Hurricane Center issued a hurricane watch for the area from Grand Isle, Louisiana, to west of Destin, Florida. The center of the storm is forecast to be near the coast within that area Saturday. A tropical storm warning is in effect from Grand Isle to the mouth of the Pearl River. The world's getting hotter, the sea's rising and there's increasing evidence neither are naturally occurring phenomena. So says a report from the U.N. International Panel on Climate Change, a document released every six years that is considered the benchmark on the topic. More than 800 authors and 50 editors from dozens of countries took part in its creation. The summary for policymakers was released early Friday, while the full report, which bills itself as "a comprehensive assessment of the physical science basis of climate change," will be distributed Monday. Other reports, including those dealing with vulnerability and mitigation, will be released next year. The start of salvage operation of the Costa Concordia cruise ship that was to have begun early Monday off the coast of Italy has been delayed for about two hours because of strong thunderstorms overnight, officials said Monday. The giant vessel ran aground and tipped over in January 2012, killing 32 of the 4,200 people on board. Residents of Mexico's central state of San Luis Potosi felt Saturday the first signs of Hurricane Ingrid's outer bands. Government agency Notimex reported damaged and collapsed roads and flooded homes. It said authorities evacuated residents in danger areas, taking them to one of more than 50 shelters in the region. Emergency crews distributed supplies in boats to areas unreachable by land. Riverside towns were stranded after the water rose to critical levels. The National Hurricane Center in the United States warned Ingrid could dump 10 to 15 inches of rain over Mexico's eastern region, with 25 inches expected in mountainous areas. The rainfall would mean flash floods and mudslides for saturated areas. A lightning strike in metropolitan Miami Monday afternoon killed a man and injured two of his friends, police said. Andres Telles, 31, and his friends, Fidelmar Montero and Miguel Lopez, were pressure-washing a tractor-trailer rig when the lightning bolt hit. "We went outside, and all three of them were on the ground," Janet Suarez told CNN affiliate WSVN. They were on a 10-day trek through the wilderness, just four guys and six llamas. Expecting to commune with nature, they instead faced its sheer, raw power when their hike was cut short by the huge wildfire ravaging northern California. David Hermanson, a 30-year-old artist and air conditioner repairman from the San Diego area, knows Yosemite National Park like the back of his hand. "Me and my dad have been hiking Yosemite every year since I was seven," he said. A northern California wildfire grew to historic proportions early Monday, becoming the 14th largest in state history. The sprawling Rim Fire, which has devoured nearly 144,000 acres, has scorched an area about the size of the city of Chicago while more than 3,400 firefighters try to rein it in. Susan Loesch and Curtis Evans just started settling into their second home in California's Sierra foothills a few months ago. Now, they're worried it could go up in smoke as the massive wildfire spreads. Tropical Storm Fernand slammed into the east coast of Mexico late Sunday, just hours after it formed over the western Bay of Campeche, bringing with it the threat of heavy rains. The storm made landfall at 11:45 p.m. CT (12:45 a.m. ET) about 25 miles (40 kilometers) north-northwest of Veracruz, according to the Miami-based National Hurricane Center. Fernand had maximum sustained winds of 50 mph and was heading west at 9 mph. The storm is expected to weaken as it heads inland. Heavy rain continued to lash the northern Philippines on Wednesday, a day after flooding put more than half of the Manila region under water. The relentless monsoon rains, intensified by a tropical storm at sea, have so far led to eight deaths. More than 280,000 people have fled from their homes, authorities said. The muddy flood waters have swamped roads and buildings, bringing life in many areas to a standstill. The stubborn Beaver Creek wildfire has 1,200 firefighters toiling tirelessly in Idaho to keep it from spreading. The wildfire scorching Sun Valley, Idaho, has already consumed more than 100,000 acres, and threatened 5,000 homes. Sun Valley is home to many pricey spreads, including second homes reportedly owned by actors Tom Hanks and Bruce Willis. The world's strongest storm of the year so far plowed across the northern Philippines on Monday, killing at least one person and leaving 20 fishermen missing. Packing winds as strong as 200 kilometers per hour (124 mph), Typhoon Utor made landfall early Monday on the east coast of the Philippine island of Luzon, damaging hundreds of houses. "It's the strongest typhoon we've had so far on the planet this year," said CNN International meteorologist Samantha Mohr. "So that gives you some idea of the magnitude of this system." 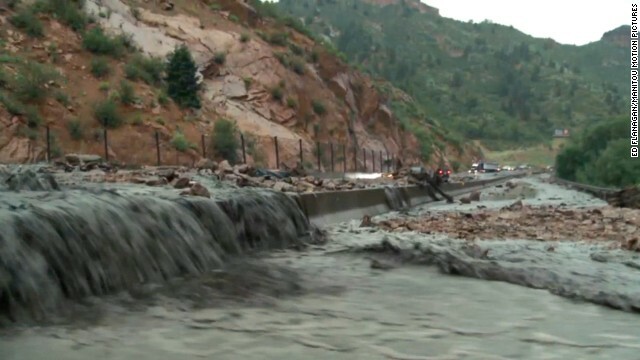 Floodwaters wash over a highway in Manitou Springs, Colorado, this weekend. Three people were unaccounted for in Manitou Springs, Colorado, after an inch and a half of rain caused flash floods, the town's police chief said Saturday. One of the missing is a petite blonde woman "seen near the creek hanging in a tree one minute and not seen the next," Police Chief Joe Ribeiro said. Two other men were also reported missing by a family member and a neighbor. The National Weather Service say more showers and thunderstorms are expected through the weekend in states ranging from the Pacific Northwest to the deep South. In Colorado, slow-moving, heavy rain could wreak even more havoc by way of flash flooding as it falls on saturated and unstable soils in the area plagued by last year's devastating Waldo Canyon wildfire.